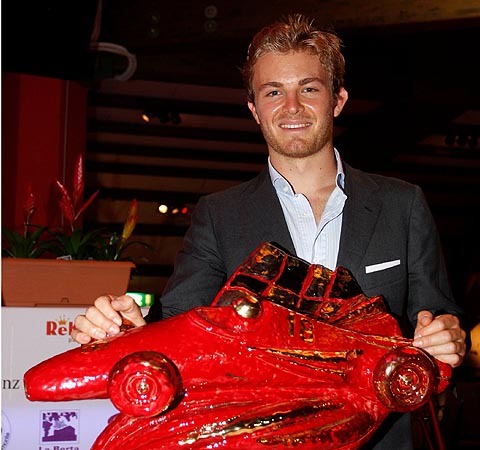 Mercedes driver Nico Rosberg has received the 2011 Lorenzo Bandini Trophy in recognition of his performances during the 2010 season. Established in 1992, in recognition of the Italian driver who perished in a horrendous accident at Monaco in 1967, the award is made annually to an outstanding figure from the world of motor racing. Previous recipients include: David Coulthard, Jacques Villeneuve, Jenson Button, Juan Pablo Montoya, Michael Schumacher, Kimi Raikkonen, Fernando Alonso, Robert Kubica, Sebastian Vettel and Lewis Hamilton. Speaking at the ceremony in Brisighella (Bandini's hometown), at the weekend, Rosberg said: "It's a great honour to be awarded the Bandini Trophy. It's not just awarded for achievements on the race track, but also a driver's mentality and approach to the sport, which gives it extra meaning. "I had great fun driving the DTM car on the open roads," he continued, referring to a demonstration run he had completed earlier. "There was just one police car in front of me and traffic coming from the other direction, which the police had to clear out of the way. It was an incredible sight - and especially because there were spectators lining the route all the way. "The Italian people have an incredible enthusiasm and passion for motor sport. The trophy itself is fantastic, like a piece of art. It's very, very heavy - I nearly had to interrupt the photo calls because I couldn't hold it any more!" Writing on his own website, he added: "When I look down the list of previous winners, it's like seeing a 'who's who' for motor sport fans. I am honoured to receive this year's prize."